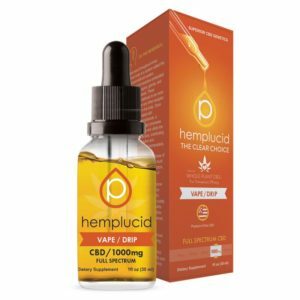 Hemplucid Vape/Drip CBD Tincture, Made from whole plant Hemp and ultra refined and de-waxed. The oil is then bonded with glycerin through a proprietary process that uncorks the tasty terpenes and flavonoids. It has a surprising smell and flavor. This liquid is meant for vaping devices but can be consumed orally. Natural Flavor. It is GMP certified, Non-GMO, USDA Organic and Kosher. Available in 150mg, 300mg, 500mg, 1000mg and 1500mg sizes.